Hey! Today I’ve got a polish that shines for dayyyyssss, even if the weather outside is absolutely disgusting. 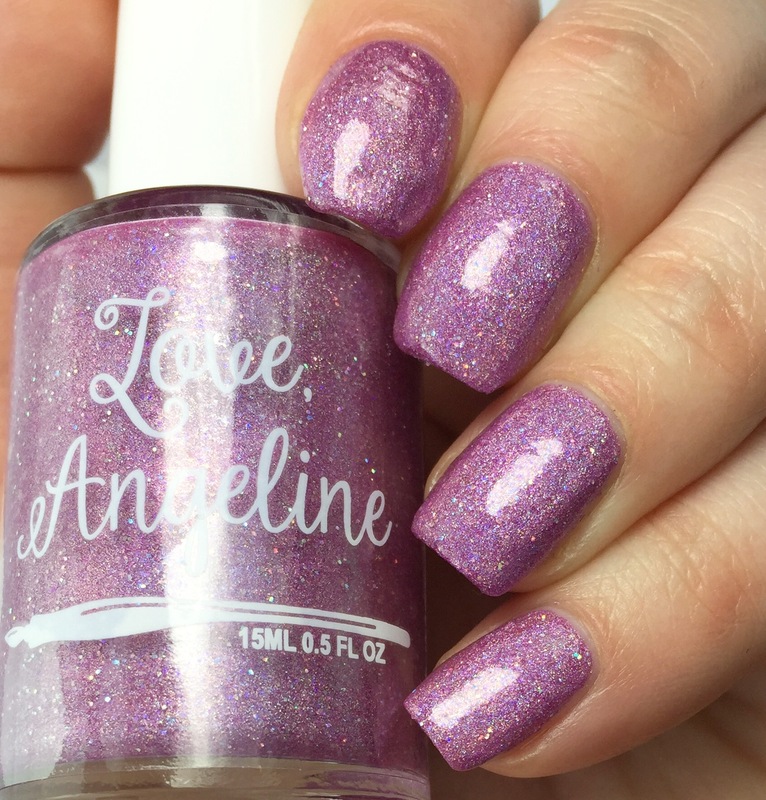 I’ve got Love, Angeline’s “Young Love,” a pinky-purple holo with holo microglitter. This is the kind of color and finish combo that will ALWAYS catch my attention. I see swatches of things with the holo-on-holo effect that the added microglitter lends to the polish, and I just lose all control. Like rabies? But holo-microglitter-sparkle-rabies? The color and finish? Definitely a winner. The formula? Honestly not my favorite ever from Love, Angeline. I’m not sure if my bottle was effected by the below freezing temperatures in which it arrived, but when I applied it, the viscosity was a bit off (what I think of as “snot-like”), so the first layer was a bit patchy and difficult to work with. Things improved on the second layer, and as you can see, it generally ended up smooth. (Except for my pointer finger, that jerk just wouldn’t cooperate.) Despite my struggles,I wore this color for a bit, even transforming it as the base for nail art later on. I was quite happy with the wear time- I also swear by Love, Angeline’s top coat, “Topped With Love,” with dries super quick and (for my body chemistry) lasts as long as I need it to. I’m looking high and low, and can’t seem to find “Young Love” on Love, Angeline’s new site. 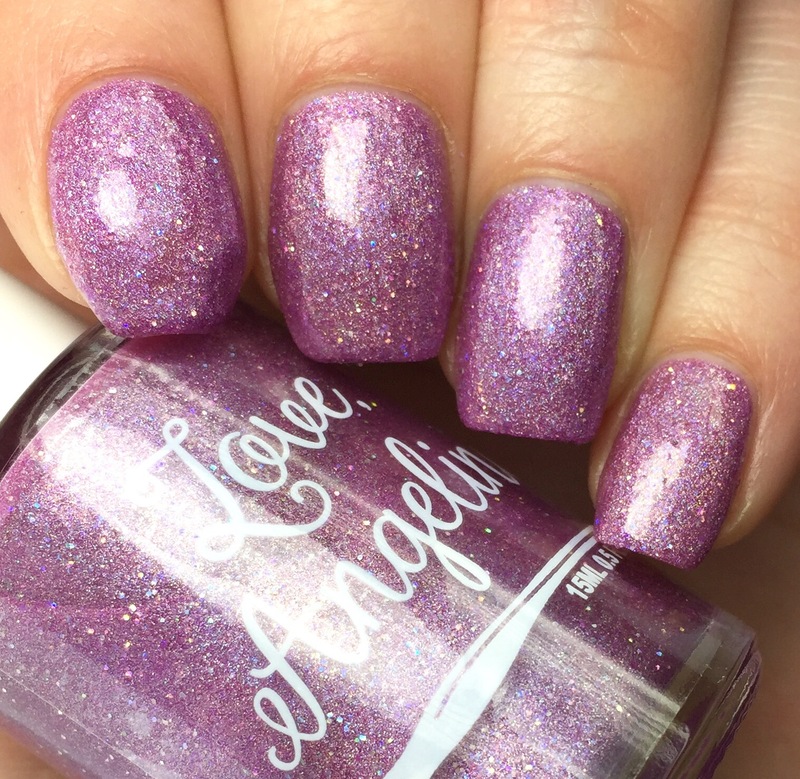 It may have been a monthly LE or a special polish for the Facebook fan group (Love Letters From Love Angeline)? I’m clearly having a major brain fart on this. When did I purchase it? How? I will say, however, that it looks like the next monthly LE has a similar finish with holo + holo microglitters, but with a deep kelly green color for the St. Patrick’s Day holiday. What do you think? What’s your kryptonite finish? What are your thoughts on the prevalence of monthly LEs these days? a very soft pink! Lovely for this time of year. Very pretty! I’m kind of like whatevs when it comes to LEs cool if I try to get one but so many others to buy if I can get it! It’s pretty but I do find it hard to keep up with monthly LE releases.